History has it that in the 1924 when Dubsdread Golf Course in Orlando, Florida was formed, it was a very difficult course to play. It was dreaded by newer golfers (Dubs) and thus the name Dusdread came into existence. Today it is a gorgeous and well know as a magnificent golf course. It happens to be an outstanding wedding destination as well. It features a gorgeous courtyard outlined by beautiful Oak trees and a vista of the course itself. It was into this setting that Kurt and Jillian brought their family and friends to celebrate their wedding. 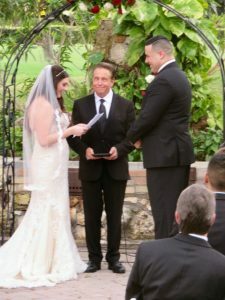 Lon Tosi of Celebration, Florida from the Orlando team of Sensational Ceremonies worked with the couple to build a fantastic custom wedding ceremony. The ceremony was rich in key thoughts and feelings. It spoke of their need to have the big four important ingredients in a marriage: love, friendship, loyalty and trust. These amazing words about love emerged above all others with the following stanza: “It was love that brought you together to unite your destinies”. Jillian and Kurt both totally agreed with this statement and insisted that it be included in their special ceremony. They wrote letters to one another expressing their feelings and love at that moment in time. That provided a special moment in time for all involved. They passed their rings to their family members and bridal party in the heart warming “Warming of The Rings”. Each person involved held the rings for a moment warming them with their silent best wishes. That provided such a great moment in the ceremony. The great DJ Justin Coulter from Soundwave Entertainment played a soft tune during the Warming of The Rings. That was such a great moment in the ceremony. The couple provide an opportunity for each of their mothers to read special passages for the group. In recognition of the Jewish Heritage of the groom, the ceremony ended with a wonderful tradition entitled The Breaking of The Glass. It is notable that the glass that was broken during the ceremony will be molded into the a mosaic that will be displayed in their home as a constant reminder of their special day. It is notable that the team from Cricket’s Photo and Cinema was on hand to capture the moments both in photos and on video. Both are certain to be amazing! The couple and their audience retired to a great reception to the grand ballroom with food and beverage provided by The Dubsdread Catering Team. Wow! They had a fantastic dining experience. The food at Dubsdread is amazing! We at Sensational Ceremonies wish you much luck with your marriage Jillian and Kurt! You are a great couple!